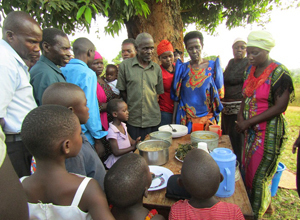 Kabumba Cooperative, which has mainly been working on income generation, voluntarily started nutrition improvement activities. 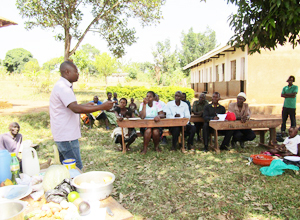 The cooperative’s supervisory committee observed effectiveness of the nutrition improvement project that HFW had previously carried out in the area. The committee concluded that cooperative members who had not been covered by the program should also be benefited from the similar activity to improve their nutritional conditions. 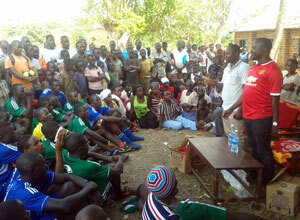 The committee planned the project and started with the approval of its board of directors. The cooperative has distributed 32 kids to the 32 households of the cooperative members with a pregnant mother or a child under 5 years old. The kids were born from the goats provided to the target households in HFW’s project between 2014 and 2015. Seeds and saplings of orange-colored sweet potatoes, gooseberry etc. 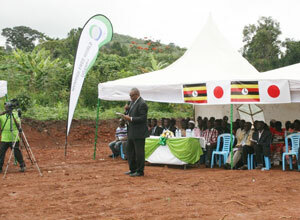 were also given away to more than 50 households of cooperative members. They were harvested from the crops what HFW had previously provided. 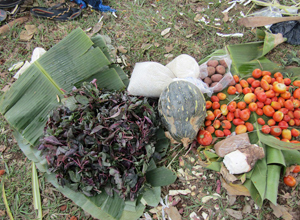 The cooperative also recommended growing nutritious indigenous plants such as green vegetables, carrots, and pumpkins. 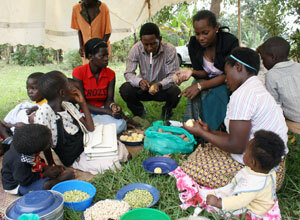 In January, the cooperative organized a nutrition improvement workshop. 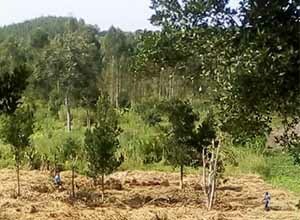 Thirty-five people including the leaders and residents of Buso Village as well as residents of neighboring villages participated. The facilitator of the project explained the importance of balanced diet and presented how to cook porridge and meals for young children. HFW staffs also took part in the workshop and illustrated concrete examples of incidents in which “the right to food” was about to be violated. Participants took great interest in the workshop and asked so many questions that they run out of time. 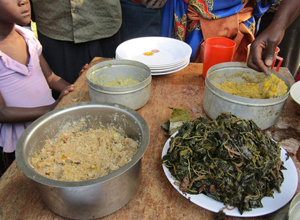 Many said that they realized the importance of well balanced meals for the first time through the workshop. HFW will share the experiences of Kabumba Cooperative to other areas and encourage the residents to play main rolls to improve the quality of their lives throughout the region. The participants did not seem to have appropriate knowledge on nutrition, so they were asking questions very enthusiastically during the workshop. I am very pleased to realize that we can improve everybody’s life. I was very impressed by the porridge for children. It is simple and easy to make at a reasonable cost. In the past, we often gave children only tea at the time of meals. We do not add sugar to it because we cannot afford it. I realized through the training session that it was natural for children not to do well at school and often get sick because of hunger. From now on, I will prepare porridge for children. If we always feed it to them, their school performance will be better.